Sub-Spindle, Y-Axis, Spindle Chiller, High Pressure Coolant System Thermally Controlled to minimize thermal growth. 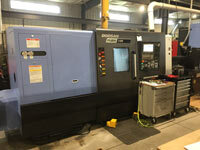 The combination of live tooling and a sub-spindle makes this machine capable of performing milling, drilling and machining of a parts backside without opening the door. Additionally, live tooling and sub-spindles enable us to eliminate secondary operations, part flipping, and the need to use more pieces of machinery to complete your part. Ultimately, it reduces handling time, set-up time, machine time, and labor; resulting in a cost savings to you! Parts Catcher, Full "C" Axis and "Y" Axis, sub-spindle, power 35 H.P. Main Spindle, Chip Blaster high pressure coolant system 1000 PSI. 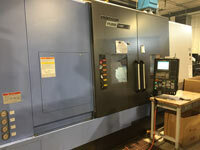 Parts catcher, Iemca bar feeder, tail stock, 31" bed capacity, 30 H.P., Programmable Tailstock. LNS bar feeder system, parts catcher, full "Y" and "C" axis, programmable tailstock, power 35 H.P., Chip Blaster high pressure coolant system 1000 PSI. Iemca bar feeder system, parts catcher, full "Y" and "C" axis, programmable tailstock, power 30 H.P. Equipped with 6 Axis, 44lb Fanuc Robot. Robot capacity is from 1.4" DIA to 8.6" DIA with a max weight of 40 lbs. Also equipped with 24 station live turret with capability for main and sub spindle. Full C-Axis and Y-Axis also on main and sub spindles. Spindle Chiller, 1000 PSI High Pressure Coolant System, Thermal Growth monitoring system on all axis, coolant chilling system that holds coolant within 2°. Parts catcher, programmable tail stock, 50" bed, 35 H.P. Parts catcher, programmable tail stock, 25 H.P. This machine will pick raw stock, load machine, machine item, remove finished part and reload new raw stock. This machine can run unmanned and lights out. Its advanced technology allows the machine to notify an on or offsite operator when tool changes are needed, when raw stock is low, and more. This machine reduces man hours and lowers costs. 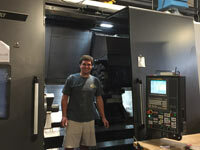 In addition, this machine is live tool capable which eliminates most secondary operations! Volumes of 500 or more see the greatest cost savings.